As part of my ongoing attempt to be more of a minimalist, I’m cleaning out my closet again this year using the hanger-flip method. At six weeks into the year, I’d say I’ve worn 40-50% of my wardrobe. The downside of using the hanger-flip method to clean out your wardrobe is you’re always aware of what you have and haven’t worn. There are days when I’m getting dressed where I specifically look for something I haven’t worn yet instead of thinking about what I feel like wearing that day. I’m sure there were a handful of times during last year’s clean out when I wore a garment just to “save” it from going into the going-to-charity pile, which goes against the principle of doing the closet clean out in the first place. If you have to make an effort to wear something, you probably won’t even notice if it’s not in your wardrobe anymore. I was recently inspired to take a hard look at my wardrobe. My law firm celebrates T-shirt Friday every Friday, meaning that no matter what’s on your calendar, you wear a t-shirt to work. I was curious to know if I could go a year without repeating a t-shirt for T-shirt Fridays and I was a little astonished to realize I have 52 t-shirts in my wardrobe. That’s way more than what I really need. In my defense, some of those shirts are amazing – like the custom shirts from Ignite Phoenix. But there are others that I need to consider more closely. For instance, I usually wear a unisex small shirt but I have a few mediums for kicking around the house – but do I really need three of them? I was recently at a conference where a vendor was giving away shirts with a really cool design, but by then they only had XLs left. I took one at the suggestion that I wear it as a night shirt. I already have an XL night shirt that I wear every night that I got at the same event last year. The XL night shirt that I used before that was one that I got in 1995 and I wore it until it became threadbare, practically see through, and was getting more holes every time I washed it. I won’t need another night shirt anytime soon so the new freebie went into the charity pile. Looking at my t-shirts made me start looking at the rest of my wardrobe. I looked at the upper shelf in my closet and counted that I have 12 pullover sweaters. And remember, I live in the desert – I don’t need 12 sweaters. I took an honest look at them and pulled four of them out that I know I don’t wear anymore. I’m sure I could pare down the pile even more. 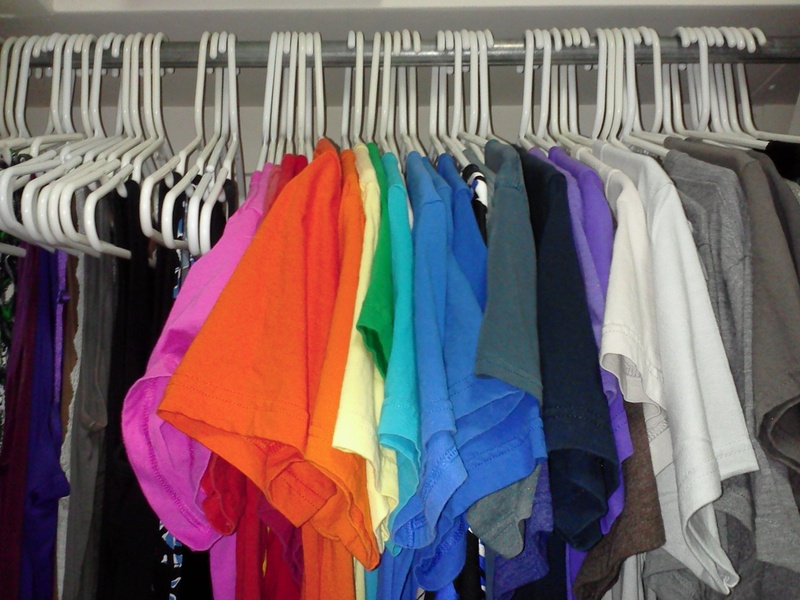 I also took a hard look at my garments on the hangers and pulled at least ten items out and hung them in the hall closet. If I find myself wanting to wear any of them later this year, I can go get it, but putting them out of sight provides a trial run to see what it would be like not to have them in my wardrobe anymore. I’m pretty sure I won’t miss any of them. I accept that I probably never be a complete minimalist when it comes to my wardrobe. I enjoy the variety too much. I have admiration for people who can do it and make it work. If you want to be more of a fashion minimalist, consider trying to create a capsule wardrobe – a wardrobe built on ~33 items that can be mixed and matched for three months. If you want to go a more extreme route, you can replicate what Nadia Eghbal did and wear the same outfit every day for a year. For those of you who are on Reddit, I posted a question about whether minimalism was harder from women than men – at least from a fashion perspective – and it generated a lot more discussion than I expected. Check it out here.